The colors we choose for our home speak volumes about our personality and style. When it comes to color, some homeowners are more adventurous while others lean toward hues that are mild and understated yet still convey individuality. Color has a direct impact on our emotions. Some homeowners desire an overall neutral palette that creates a pleasing, tranquil space while others prefer introducing lively hues that provoke an energetic atmosphere. Whatever your preferred palette profile, there are many ways to introduce color into your home. Clothing is the catalyst for residential color trends, working its way from fashion into our living spaces. For the past few years, gray has been a forerunner in the neutral color space, replacing browns and beiges that once graced the walls of many a Bay Area home. 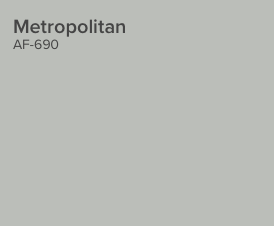 In keeping with this popular color inclination, Benjamin Moore’s Color of 2019 is Metropolitan, an adaptable, stylish, and understated neutral gray. The company also creates a coordinating color palette designed to work beautifully with their starring hue. Sherwin Williams has traveled down a different path with their rich terracotta hue, Cavern Clay, the earthy quality of which works well as an accent wall coupled with neutral tones or as a standalone color, infusing a warm sophistication to an entire room. 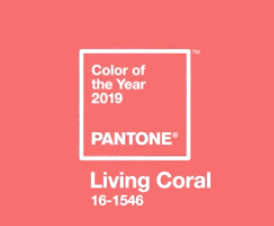 Pantone recently announced that their Color of the Year for 2019 is Living Coral, which they describe as “an animated, life-affirming coral hue with a golden undertone that energizes and enlivens.” Vibrant and at the same time soothing, Living Coral embodies our “need for optimism,” providing a sociable, spirited, and playful manner in which to invite connection and intimacy in our home environment. Other color palettes are finding their way from the runway into hallways, kitchens, and livings spaces. Turquoise, navy blue, metallic including gold and rose gold, and matte black are trending in popularity as homeowners personalize with pigments in a myriad of manners. Adding vibrant pops of color is a great way to infuse character and playfulness throughout your home. Colored cabinets, entry doors, countertops, accent walls, and tile are all wonderful ways to introduce color. In addition to navy, gray and white tones are popular palettes for kitchen cabinets. Islands offer an ideal way to introduce accent colors; wood tones are trending as popular ways in which to highlight kitchen islands. As for metallics, while chrome and satin/brushed nickel remain much-loved among homeowners, brushed brass, rich gold, and the elegance of rose gold are finding a foothold in homes. Drawer pulls and knobs, lighting, and fixtures are classic ways in which to tie in metallic throughout your home. “Tile is another way to pull in color and texture into a room,” says Sara. Geometric tiles, especially in black and white, create a high contract focal point. 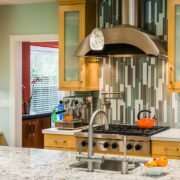 Tile backsplashes behind cooktops can be designed as a beautiful mosaic or a simply stunning accent. Shower niches are another way to imbue color into a bathroom that otherwise may embrace a neutral palette. Your home is a blank canvas and the colors you choose for your living spaces are as individual as you. The design team at Harrell Remodeling has their fingers on the pulse of the latest trends. Armed with that information plus your personal preferences, we will make your home come alive with color! Call us today to schedule a design consultation with a Harrell Designer to discuss your next remodeling project. When redesigning a kitchen layout, Harrell designers frequently need to be creative to maximize storage in corners. 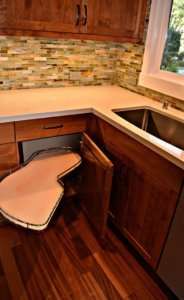 Older kitchens often left these corners very difficult to access, but there are now more creative solutions. There are generally two types of corner storage, Lazy Susans and another option referred to as a “Blind Corner”. Most people are familiar with a Lazy Susan, a circular “plate” that spins, enabling easy access to everything housed on its flat surface. Lazy Susans are the most efficient use of space in a corner cabinet. They require 36” in both directions at the corner and function in much the same manner as the table-top device or ones frequently used to hold spices. There are three main styles of Lazy Susans, the first being a unit with two flat, spinning surfaces that are attached to a center pole, but these can be flimsy, so Gloria rarely specifies them. A “Super Susan,” has spinning flat surfaces that sit on stationary shelves, making them more sturdy and also avoiding items from falling off into inaccessible areas. 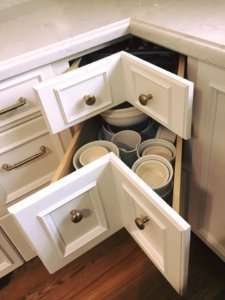 The third type of Lazy Susan is a push-through Lazy Susan, in which the soft-close cabinet doors fold in on themselves and the interior storage units spin outside the cabinet for extra easy access. The other storage option that Gloria recommends is for blind corners, which requires 27” in one direction and 48” in the other. Two popular Blind Corner options are the Magic Corner and the LeMans system. These storage systems tend to be utilized when the blind corner space is shorter on one side than the other. Comprised of multiple baskets or shelves, the LeMans and Magic Corner are designed so that one unit slides forward and out when the door is opened while the rear storage units move into the cabinet opening, providing complete access. “I work closely with all of my clients to understand how they function in their kitchens. This, in addition to the available space in the corner, will give me the information needed to make product recommendations,” Gloria explains. Whichever corner storage option is chosen, ideal access must be considered. 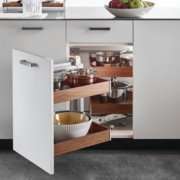 A bifold door hinged in the middle is often specified for a Lazy Susan, whereas Blind Corner cabinets typically have a single hinged door on the long side of the cabinet. With a bifold door on a Lazy Susan, Gloria carefully considers the hinge side that works best with how homeowners work in the space, allowing them maximal access to the contents of the cabinet. A push-through door can make sense when access with a bifold door is more limited. “If corners are situated near a range or cooktop, the door should open away from the appliance,” explains Gloria. Though much less common, it is possible to have drawers in corners, though they require the creation of uniquely shaped corner drawers and also don’t effectively utilize the available space. Special corner storage features are most frequently found in base cabinets but occasionally occur in wall cabinet configurations as well. Upper cabinet corners are limited to the use of Lazy Susans. If you are contemplating a kitchen remodel, it is very likely that your cabinet layout will result in corner cabinets. By understanding your storage options as well as by working with a designer who knows their stuff, those once awkward areas can be transformed using some unique storage solutions. Considering updating your kitchen? We invite you to schedule a complimentary consultation with a member of Harrell’s design team to help you explore your kitchen, bath, or home remodeling project. Focal point and pops of color are terms our designers use all the time. Both of these design aesthetics can be achieved in kitchens by incorporating colored appliances. For most homeowners, especially those who prefer safer color choices and those who are remodeling with reselling in mind, sticking with stainless steel is generally probably the best way to go. The staying power of stainless steel is timeless and typically appeals to the majority of homebuyers as well as homeowners. 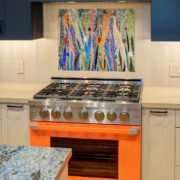 But for those who want to make a bold statement and achieve a custom design that showcases their distinctive style, colorful kitchen appliances are a great option. They add a unique focal point and that pop of color all in one fell swoop while also serving a functional purpose. There are a number of companies that offer colored appliances. Price, color availability, and style vary to fit almost any budget. Most Many companies offer colored ranges, and others some also include refrigerators and other appliances in varying hues. UsuallyOften, clients decide to have the range as the focal point with all other appliances in stainless steel or having fronts to match the cabinetry. “Whether our clients want a totally custom color, a standard or a professional-style range, or an appliance that is contemporary or really retro, we can help to find exactly what they want,” explains Gloria. BlueStar specializes in ranges, hoods, cooktops, and refrigerators ideal for the serious home cook. These professional chef-grade appliances are available in over 750 colors as well as textured finishes. BlueStar will also match customer colors so if you have a favorite, they can make it happen! Their website allows you to configure your range, choosing everything from size, number and type of burners, trim, doors as well as knob and overall color of the appliance. As you “build” your range, you can see exactly how it will look in real time on their website. 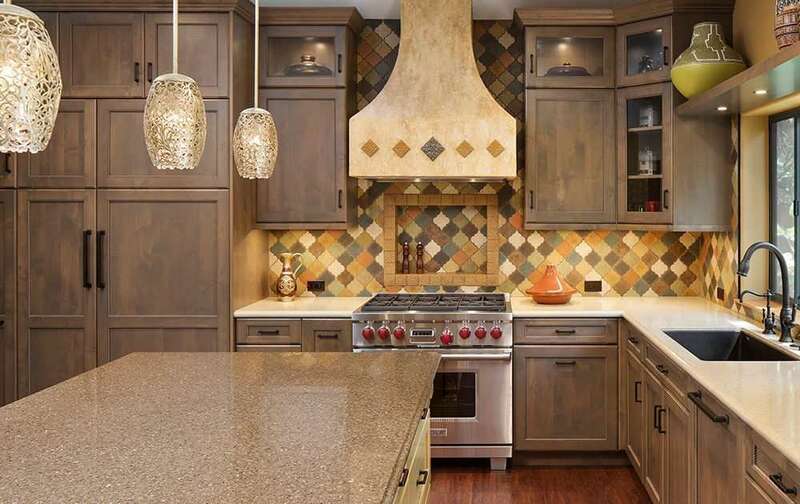 American-made Dacor offers their luxury Heritage ranges in custom colors. Dacor allows clients to add that perfect splash of color with a few standard colors as well as hundreds of custom color options. La Cornue designs high-end, handcrafted French ranges that are truly the “masterpiece of the kitchen.” These appliances are works of art and make a daring, everlasting statement while providing the ultimate in a professional-style range. Their Château and Cornufé collections each offer an incredible array of colors from which to chose, including one-of-a-kind hues. The options are endless, allowing homeowners to make an appliance statement that speaks volumes. Big Chill is a great option for clients who are looking for appliances with a vintage feel. They also have a sleek, modern Pro line as well as a classic, industrial collection. Depending upon the collection, they offer either standard hues or as many as 200 custom colors in addition to a full line of professional grade appliances including ranges, refrigerators, dishwashers, and hoods. Colored kitchen appliances can be used a number of ways, from being the singular focal point surrounded by a neutral background to making a bold statement by having all appliances a custom color. The options are endless and Harrell’s Designers are here to help you make these important decisions. We invite you to schedule a complimentary consultation with a member of Harrell’s design team to help you explore your kitchen, bath, or home remodeling project. 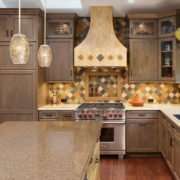 Having grown up in a traditional Jewish household that followed strict kosher guidelines, there is no one more capable to design a kosher kitchen than Harrell Remodeling designer, Debra Winston. So when Harrell was approached by a couple to update their circa-1960s kitchen while incorporating solutions that would allow them to adhere to their kosher meal preparation, Debra was exceptionally qualified for the task. The 50-year-old kitchen was dark and dated. Counter space was limited as was storage. Though the kitchen had an eat-in area, it wasn’t used as the couple ate meals in their Dining Room. The husband is kosher and his wife, a gourmet cook with Italian roots, converted to Judaism and also observes kosher practices. They enjoy entertaining and preparing large meals for friends and family, especially during Passover. There are three categories of kosher foods: meat, dairy, and pareve, which includes fruits, vegetables, grains, eggs, and other foods. To simplify the kosher concept, there must be dedicated pots, pans, knifes, bowls, dishware, and utensils for preparing, cooking, serving, and eating meat and dairy dishes. This means there are two sets of everything in addition to special dishes and serving platters for Passover. With extensive sets of duplicate cookware to function properly and follow kosher requirements, the kitchen needed considerable storage. 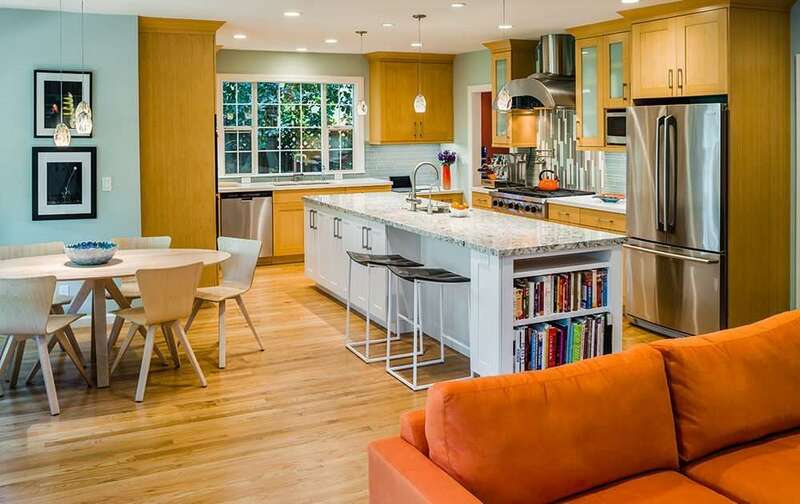 Debra’s clients also wanted high-performance appliances as well as more counter space. 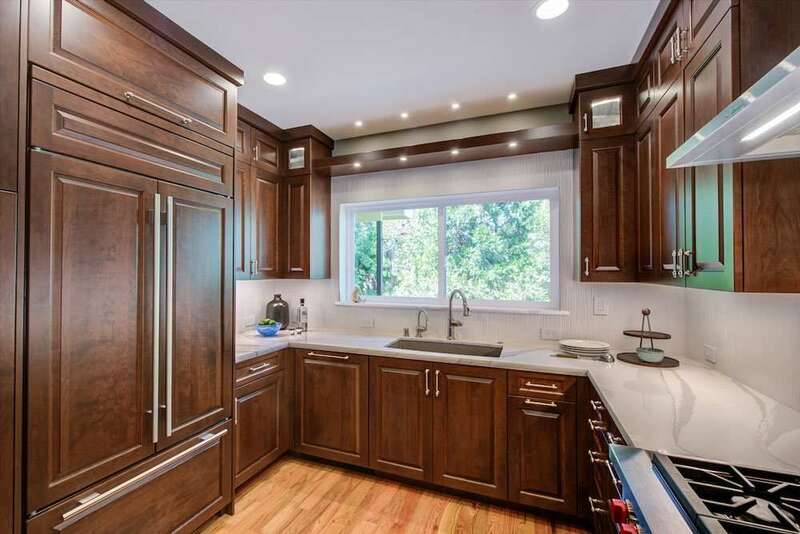 After speaking in depth with her clients, visiting their home, and armed with her personal knowledge of the kosher standards, Debra embarked on transforming their kitchen. The end result may not look any different from a classic kitchen redesign but the changes Debra incorporated made a huge difference in the couple’s ability to easily and enjoyably prepare kosher meals for themselves and guests. “I enjoy taking a poorly designed space, and reconfiguring it with an improved layout, enhanced lighting, increased accessibility, and heightened functionality,” states Debra of one of the many things she enjoys about her job as a Harrell’s designer. In this kosher kitchen, storage – and lots of it – was a crucial component of the redesign. Base cabinet drawers on either side of the range were designed for pots, pans, and other cooking utensils. One side was dedicated for tools and cookware for meat, the other for dairy. There were also independent drawers for each full set of silverware and utensils. The upper cabinets had enough space to separate meat and dairy plates as well as serving dishes. A tall narrow pantry next to the refrigerator houses spices, condiments, and a variety of ingredients. The two Kessebohmer hardware inserts hold 330 pounds each, and are open from both sides making for easy visibility and accessibility. Upon gutting the kitchen a false ceiling was discovered, which enabled the ceiling height to be raised from 95 inches to 103 inches. This allowed for secondary upper cabinets ideal for storing Passover china that is only used once a year. A cabinet above the wall oven houses vertical baking tray dividers measured to fit the owner’s baking sheets and adjustable shelves offer additional flexible storage. One of the drawers is composed of a two-tiered wood cutlery drawer with dividers, creating additional space for separate meat and dairy flatware and utensils. Another drawer has a knife block insert on the left side, and dividers to organize utensils on the right. Although there was not enough space in the kitchen for Magic Corners or swing-out half round shelves, we were able to make the blind cabinets useful. These cabinets are installed with lighting that automatically turns on, allowing easily visibility to all areas. These are used to hold trash bins, tall vases, and other items not needed on a regular basis. Glass cabinets and niches offered multiple ways for the homeowners to display special dishes, tchotchkes, and other objets d’art. In a kosher kitchen, a double basin sink is required so that meat and dairy items can be washed separately. The divide in the new sink is 6” in height, allowing pots with long handles to extend over the divider. They can soak without encroaching on or dumping water into the other side. A Blanco Silgranite sink was chosen because of its durability to resist scratches, stains, and heat. This was accented by a Brizo single handle pull-out faucet and a filtered instant hot water tap. A love of cooking and Italian heritage coupled with kosher standards necessitated desire for modern, high-performance appliances. A Sub-Zero refrigerator with wood paneling to match the cabinetry enabled them to have enough space to isolate meat and dairy. A gas 4-burner Wolf Range Top provides efficient and consistent cooking while a warming drawer takes the chill off plates and keeps prepared foods at the perfect temperature until the meal is served. In lieu of a microwave, the homeowners opted for a Miele Speed wall oven. Its compact size allows it to heat quickly, and the use of steam ensures healthy, fast food preparation. A traditional Miele convection oven is right below, allowing plenty of options when preparing meals for large gatherings. Cambria Brittanicca countertops mimic a classic white veined marble without the worry of stains, etching, or upkeep. The old engineered wood floors were replaced with authentic oak hardwood. LED lighting was used in a variety of manners to provide ambient, task, and accent illumination, all of which brightened the previously gloomy space. And, the once narrow entry into the Dining Room was widened to 45 inches, allowing a better flow between the two rooms. Thanks to Debra Winston, this gorgeous kosher kitchen has everything the homeowners desired. 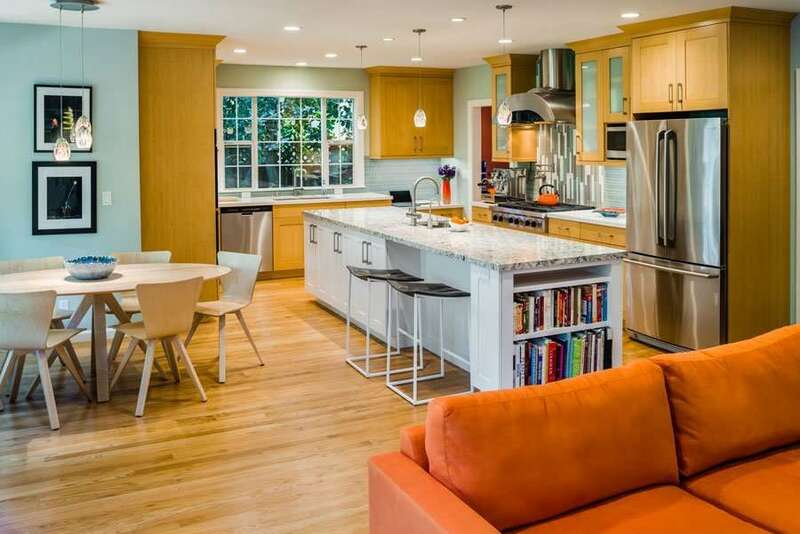 The new floor plan doubled the usable space, storage abounds, and the 1965 GE stove has been replaced by top-of-the-line Sub-Zero, Wolf and Miele appliances. With its copious storage, large double sink, and improved lighting this kitchen would also work well for those people with unique dietary requirements or food allergies who must segregate food and/or cooking tools. 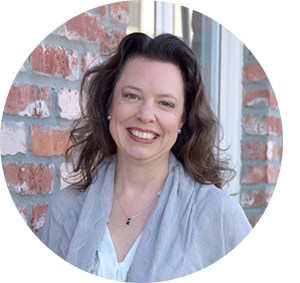 Debra has been with Harrell Remodeling Design + Build for four years. She has a Bachelor degree in Fine Arts, is a painter and quilt artist, and spent 13 years as a fashion designer for Ralph Lauren in New York City before moving to California. She studied Interior Design at Cañada College, where she specialized in Kitchen and Bath Design and worked as an Interior designer prior to joining the Harrell Team in April 2014. She has received numerous awards for her designs. Debra specializes in Kitchen and Bath redesign, is a Universal Design Certified Professional (UDCP), and also works on whole-house remodels and room additions. It’s impossible to know when or where the first backsplash was included in kitchen design, however the why behind the beauty of backsplashes isn’t hard to decipher. Backsplashes are generally found between the sink and the wall, preventing water, grease, and spaghetti sauce from being splashed against the walls. Pretty soon, simple tile backsplashes were used as the best solution for wall protection. During the 1970’s, white and yellow Formica countertops included a sort of built-in backsplash to avoid mixing materials and designs. Today, interior designers like Harrell Remodeling’s Gloria Carlson, take the backsplash into an entirely different level, maximizing the utilitarian tool as a great opportunity to create a distinctive focal point for kitchens with multiple materials and patterns. “You need to have some sort of backsplash purely for protection. Historically, people used a basic four-inch backsplash to provide minimum protection and to just catch spills. But over time, backsplashes have been used provide protection and add aesthetic interest,” explained Gloria. According to Gloria, knowing how to highlight the backsplash can be tricky. “The backsplash needs to become part of the whole story and the whole palette. For example, if you have a busy countertop material, you want to use a simple backsplash design so the two don’t compete. The backsplash in that case highlights the countertop. On the other had, you may want your backsplash to be the focal point, in which case you want your countertop to be simple and not compete with it,” said Gloria. For example, one Bay Area family came to Harrell-Remodeling to redesign their kitchen to accommodate a steady docket of formal dinners and lively entertaining events. 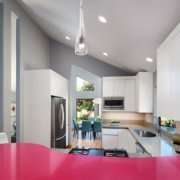 But more importantly, the family also wanted a gourmet, multi-use kitchen where entertaining and serious culinary skills could be employed without the interference of casual but valued guests. Gloria created a beautiful cooking area and a more social gathering area where people could mingle without bothering the cook. To accomplish this, she created a fun, socially focused fountain soda bar that also included a fully equipped bar gun with lots of soda flavors. 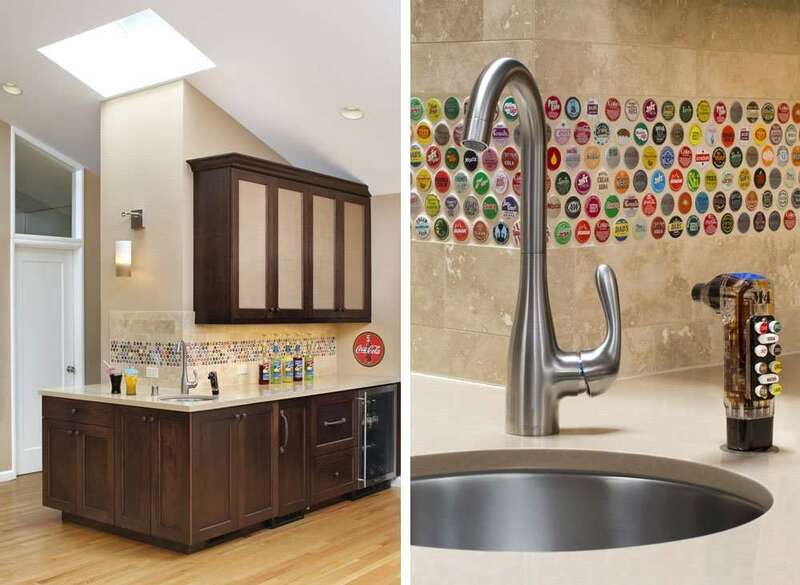 Using the backsplash as a way to highlight the design, Gloria successfully punctuated the soda theme by using the backsplash as a conversation piece and created from vintage bottle caps. The hundreds of bottle caps were individually placed in the backsplash to resemble tile, and create a fun place for people to gather away from the prep and cooking area. “The family entertained a lot, but they didn’t like when people could just walk into the middle of preparing a meal. So I used the backsplash as a focal point of my design. In this case, I a neutral, solid color for the counter top in order to make the backsplash a focal point to draw the attention of the eye,” said Gloria. Long gone are the days the four-inch Formica backsplash. 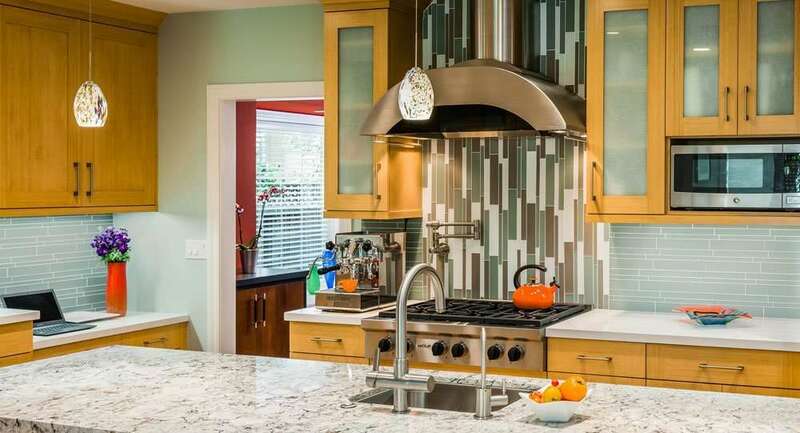 Today, designers are taking the backsplash as a way to make a real design splash in kitchens. 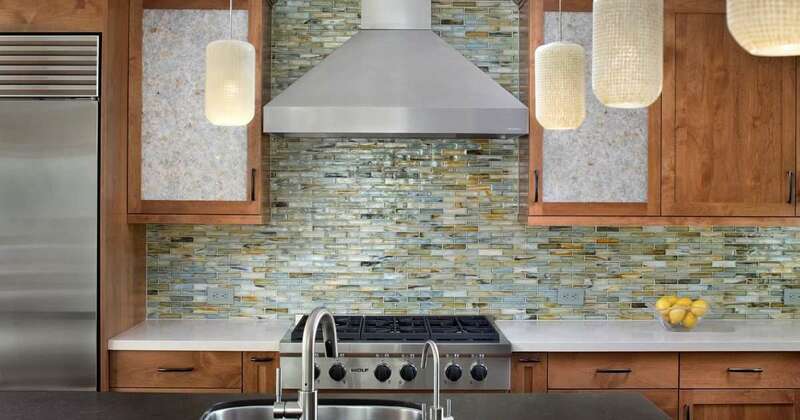 The boundaries for backsplash designs are being pushed to include modern materials and visionary shapes and sizes. Today, Gloria includes materials that range from colored glass or tile to stone slabs. 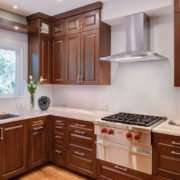 In addition, many homes now include backsplashes that run all the way up the wall to the bottom of the top cabinetry to provide maximum impact. “Depending on what else is happening. You have other when you’ve got a whole kitchen with multiple materials: you’ve got a floor, you’ve got cabinets, you’ve got countertops, you’ve got all those things that you need to have cohesive. You want to make sure that you don’t have too much going on or too much competition and you don’t know where to look. The backsplash can be one of the opportunities within that palette to make a statement. 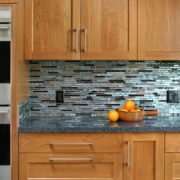 Personally I love it when people aren’t too safe with the backsplash, because it can be so effective when you want to add something striking,” said Gloria. 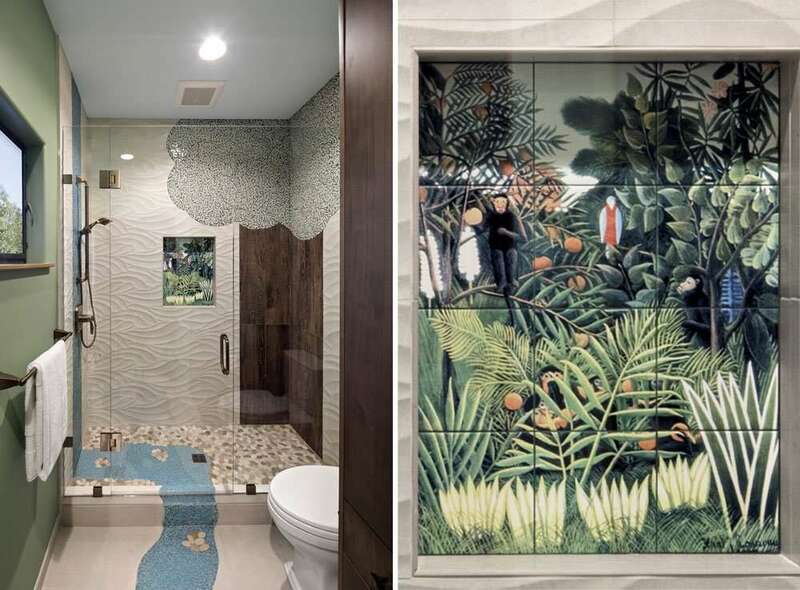 Remodeling a whole house, kitchen or bathroom can be a serious job, but it can also be a great opportunity to add some fun and playfulness into your home. Whatever room you are remodeling, the Harrell Remodeling team of employee-owners are experts at creating modern residential designs, while also developing special spaces that reflect the personality and spirit of homeowners. 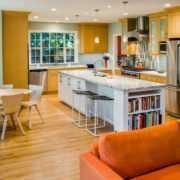 Creating unique and personalized kitchen and bathroom designs that infuse happiness and joy, may not be the first thing a homeowners thinks about when they start to consider a remodel. However, for those Bay Area residents who have found their dream home, and plan on staying in it for the foreseeable future, investing in creative designs that make a statement and stray from traditional motifs can be the perfect solution for adding a lifetime of happiness for both children and adults. The number one thing I do when I have a specialized design project is to establish a deep trust between myself and my client. Clients that want something different are very unique and special to us. They have to know that we care deeply for their home, and that I am really listening to them, illuminating their dreams. After that trust forms, we can do amazing things together. 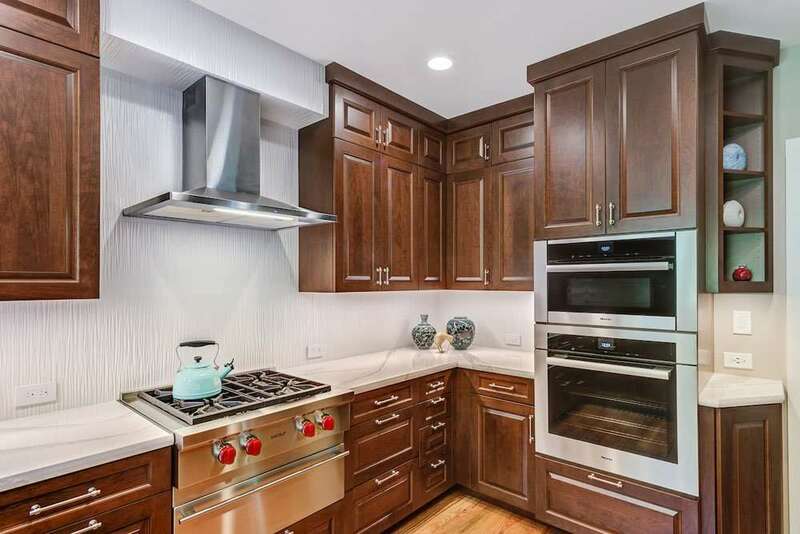 A special baking section that included an appliance garage that held mixers, bowls, yeast risers, and other appliances (five in all), all hidden behind bi-fold laminated glass doors and pull down storage areas. This zone was situated directly next to the oven. The coffee counter was designed with pull open cabinets that had laminated glass to hide coffee containers, filters, and boxes of teas. Gloria made sure the coffee and espresso machine were connected directly to a potfill faucet that is positioned perfectly for fast and easy brewing. In the center of the kitchen, Gloria designed a floating island that served as a buffet serving area, prep zone, and gathering spot. To help contribute to the central gathering purpose of the island, Gloria added a built-in filtered water faucet that included a water chiller system below the sink. Then she included a state-of-the-art carbonated soda water faucet as part of the sink and countertop. An under-the-counter refrigerator and built-in liquor cabinet makes the island anything but a place of isolation. A planning zone was created to add an additional function to the room, including organizer shelves, key hooks, and a cork and white board. 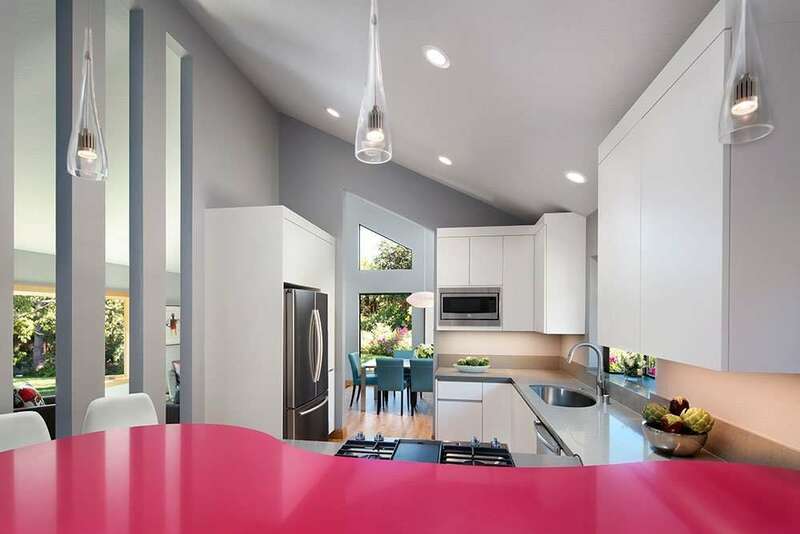 Lots of color was also incorporated into the kitchen to highlight the modern upgrades. My clients still tell me how much they love what I did in their kitchen, said Gloria. 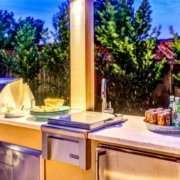 https://harrell-remodeling.com/wp-content/uploads/2017/09/DJBPhoto_140813_14707.jpg 601 900 thepointcollective https://harrell-remodeling.com/wp-content/uploads/2017/09/Harrell-Remodeling-Logo.png thepointcollective2017-09-18 14:06:542018-11-19 15:06:34Adding some playfulness and functionality to your next home remodel!